Editor’s note: The following is a guest blog post by chef, author and seafood advocate Barton Seaver. GAA and Seaver announced a partnership in early 2018 to raise public awareness of responsible aquaculture and the importance of sourcing seafood with provenance. My posts on this site have focused on how responsible fish farms benefit the communities in which they are located and beyond. These are certainly great stories for us all to tell. Aquaculture operations build economic, educational and civic services not previously available in those communities. And industry technical innovation lays the groundwork for future generations to have exciting, challenging and lucrative careers in their own communities. In this post I want to shed some light on the collaborative work being done to help advance aquaculture’s ultimate goal: providing people with access to more seafood, more often, across all demographics. On Sept. 14, 2018, I will be joining a long list of esteemed colleagues from across the seafood and health industries at the Seafood Nutrition Partnership’s second annual State of the Science Symposium, taking place at the Kaiser Family Foundation’s Barbara Jordan Conference Center in Washington, D.C. This event provides a forum for global leaders to discuss and outline the latest consensus on how seafood contributes to human health. Over-arching themes for this year’s symposium sessions include brain health, aquaculture and consumer education. The audience will represent a cross-section of professionals from federal agencies, national and international businesses, public interest foundations and non-profit organizations. The event is open to all who want to attend. My fellow presenters and I – prominent neuroscience, medical and nutrition researchers and practitioners, aquaculture experts and communication specialists — will provide an update on reams of relevant research from within each field. Educational presentations will be paired with technical analysis and will yield data points and trend information that we all can share with our own communities to encourage increased seafood consumption. I am very excited to be a part of this event and invite you to join me if you’re able. If you can’t make it to Washington on Sept. 14, visit www.seafoodnutrition.org later this month to view videos of all the sessions at your convenience. 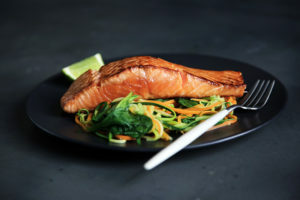 By participating in these symposium sessions in whatever manner you can, you will gain a better understanding of just how much-increased seafood consumption contributes to a healthy lifestyle and positively positions us as producers of these essential foods. And while you’re there, be the example we want others to follow by making a personal commitment to health and take the Seafood Nutrition Partnership’s pledge to eat seafood at least two times per week.